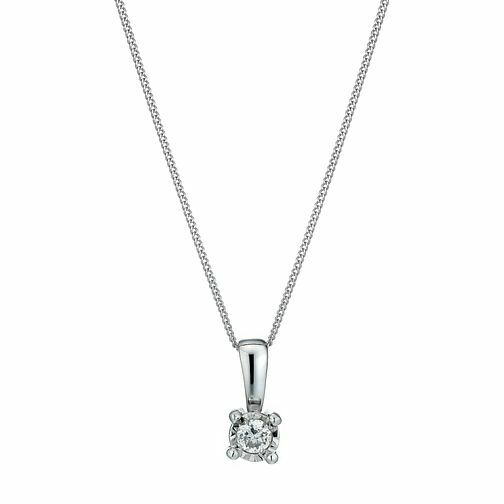 Add a splash of sparkle to your look, with this 9ct white gold illusion diamond pendant. Set in a four claw clasp, this elegant diamond pendant glistens beautifully. Perfect with your LBD. 9ct White Gold Illusion Diamond Pendant Necklace is rated 4.3 out of 5 by 3. Rated 5 out of 5 by Anonymous from Lovely looking Amazing gift for my girlfriend, she loved it and couldn't ask for much more! Rated 3 out of 5 by Anonymous from Great product The necklace itself is great - exactly as expected purchasing from the website and the receiver was extremely happy. However, the packaging and gift box it was received in was damaged. Luckily enough, I had a H Samuel shop on the way to give the gift (Northumberland Street, Newcastle) and they were very apologetic and replaced the box so the gift was in an acceptable condition. I also received money off my purchase due to the inconvenience which was well received and handled well.